I am writing up this post in a much better frame of mind, thank Goodness! In fact, everything has improved since my last post. But best news of all – is that my second Grandchild is well on HER way! So I will have a Granddaughter who is due to be born at the beginning of August. I am so happy for Emma and Ash and absolutely thrilled that it’s going to be a girl! The weather has been amazing and it seems as though we’ve not really had a winter this year. I’ve not had to buy any gas bottles for the heater and I’ve hardly used my electric blanket! I’ve saved money on not having to use the immersion because we’ve had so many days of sunshine these past three months. So haven’t we been lucky! However, strong south winds have been battering Crete and bringing heaps of dust and sand from Africa with it. They brought havoc to many parts of Chania and also our area of Apokoronas, causing several fires to break out. We’ve had hardly any rain this winter and so the land is really dry and brittle. Where I live, perched high above the sea, it can be quite scary and I had another sleepless night worrying about the damage the strong winds might have been doing. It was like trying to sleep through a hurricane that night! 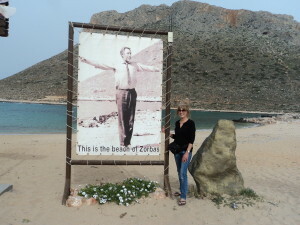 Stavros – the beach of Zorbas! Standing next to Anthony Quinn! I squeezed in another beachcombing trip to Stavros but I’m still not doing enough and time is running out. Stavros was lovely, though and I took a couple of friends along with me. This is the place where they filmed a large part of that iconic film – Zorba the Greek, and I got my friend Chris to take a photo of me standing right next to the life-sized poster of Anthony Quinn doing his ‘Zorba the Greek’ dance. The poster is situated in almost exactly the same position he was dancing. You can see the mountain behind him and the same mountain behind me! 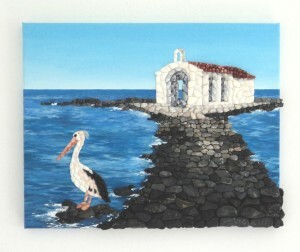 I also went to Georgioupoli a couple of times, to collect the final stones and pebbles I needed in order to complete the 2 commissions I have been working on. This was indeed a challenging project but as with all my artworks – a most pleasurable one! Eric and Fahimeh were really pleased with the photographs I sent them of the finished artworks, but sadly, will not be seeing them in real life, until they move to Australia in a few months time. I am really impressed with Crete’s Hellenic Postal Service. So all has been going swimmingly well after months of trouble and strife. A wonderful couple called Bob and Liz, whom I am only just getting to know, came over to my house one early evening a week ago, bringing wine and wonderful nibbles with them! They are such lovely, warm and generous people. 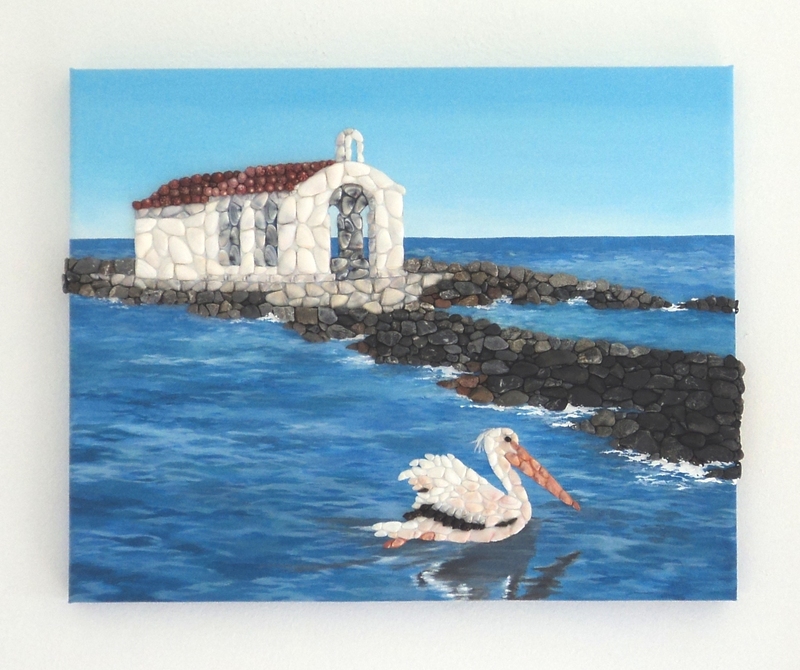 They had asked to come over and choose a couple of my artworks for their fabulous villa in Kokkino Chorio. I was invited to lunch there about a month ago and it’s a really special place with wonderful grounds and views! Bob had previously commissioned me to create a Seashell Mosaic Collage of his three Granddaughters, before Christmas last year. Anyway, they purchased three pictures in the end! Two of which were actually hanging on my lounge wall and the third was my recent Flamingos design. This was great news for me and goes most of the way to covering my next two months’ rent. The timing was perfect and so grateful thanks go to Bob and Liz for appreciating my art so much! 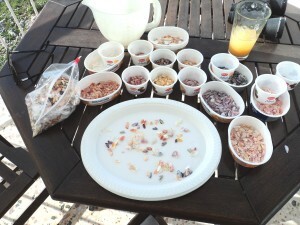 Happily sorting my wonderful Coquina seashells into colours! I received another wonderfully hand-selected Coquina seashell order from Bonnie and Nancy in Florida, and spent countless happy hours sorting them all into colours. Such amazing natural colours in all the shades you can imagine. Coquina seashells really are a joy to work with! Naturally there have still been problems, but I’ve been able to handle them a lot better. A couple of weeks ago the council dug up the road near my home and our water got cut off because they damaged the pipes. For almost two days, life was a real hassle. We are so used to turning on a tap and bingo – there’s the water! You certainly find out just how precious water is when you haven’t got any! You can live without electricity, but not water. Meanwhile the job the council started appears to have been abandoned – leaving all the water pipes of the surrounding houses and restaurant exposed.. and no-one knows for how long! 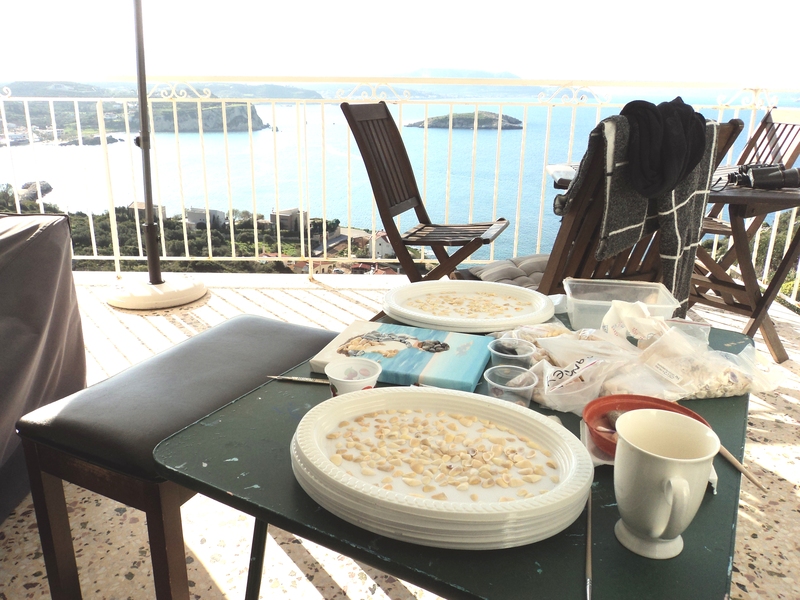 So many sunny days this winter… great for working on my lovely balcony! On the subject of electricity, after getting used to power cuts for the last nine years, we seem to have had more than our fair share of them this winter. So for one night I was without electricity and water and the wind was howling around the house! Yet this is all part of the charm of living on Crete and I wouldn’t have it any other way! This entry was posted in Blog Posts and tagged Seashell Mosaic Collage & Acrylic Painting by micmaryjo. Bookmark the permalink.